The location: The Narcotics Anonymous Meeting Hall. A. A church school room, being used for a Narcotics Anonymous meeting. In the previous episode, when Rita learned that Dexter framed her ex-husband (injecting him with heroin), she assumed that Dexter was himself an addict, and forced him to enter a program. 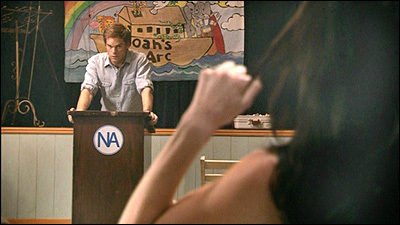 At the start of Episode 3, we see Dexter attending a meeting of Narcotics Anonymous. He's bored senseless, and soon leaves early, which brings him to the attention of Lila, a stranger who is also attending the meeting. At the next NA meeting, Lila sees him getting a cup of coffee during a break, and invites him to go with her to the diner next door, where the coffee is better. We see the exterior of the building one more time, when Rita drops Dexter off at a meeting, and sees Lila for the first time. A. A yacht club building. A. 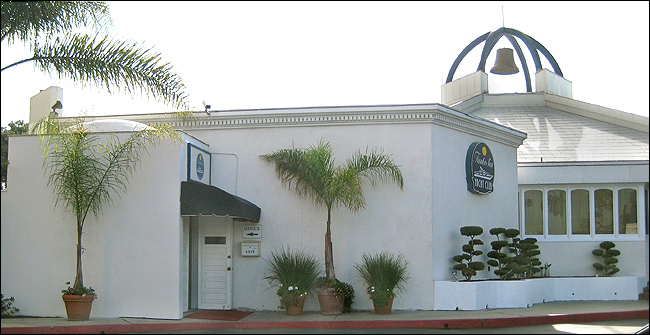 The exterior of the building was actually the Fantasea Yacht Club, at 4215 Admiralty Way, in Marina Del Rey, CA. 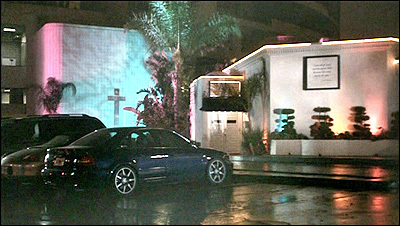 The club is located right next door to (east of) the diner / coffee shop where Lila takes Dexter for coffee during a break at the meeting. And the large parking lot behind it (to the south) is where they shot the used car lot scenes. To get there from Lincoln Blvd (the main street in Marina Del Rey), turn west on Bali Way, then quickly turn right on Admiralty Way. Follow Admiralty Way around the edge of the marina, and the yacht club and diner will be on your left (south) side. Here is an aerial photo of the area, with the yacht club marked (as well as the diner). And here is a map link. A. This was difficult. You can't see that much of the building, since it's a night time scene, and the shots of it are tightly cropped. Fortunately, I had a few things going for me. When Rita drops off Dexter at the meeting, you can see a Marriott hotel in the background. Also, in the shot of Lila outside, you can see the number 4215 on the wall. (Of course, that might have been a fake number, but in this case, it was real.) So I did a Google search for Marriott hotels in the L.A. area with a 4000 address. And sure enough, the Marriott Hotel in Marina Del Rey is at 4100 Admiralty Way. 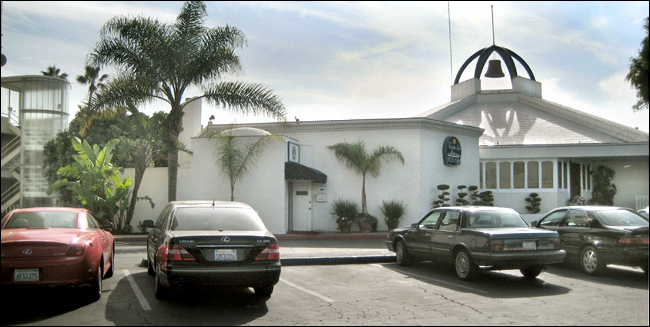 Since I knew they had been filming in Marina Del Rey at the diner, that made perfect sense. So it was then just a matter of checking to see what kind of business operated out of 4215 Admiralty, and to match up the actual building with the screenshot.